The tents are packed away! The memories are all that remain! Of the good times we had out on the Plain! We gathered our family near the home quarters! Coming together, from all four corners! if not decades in some cases! The next morning we awoke, some of us not having gone to sleep, by 10 AM we got to the church, where I know that I shall probably always remember that wonderful talk by L'Abbe Roland Gaudet! The story he told was incredible. All the more so since it was ours! We are fortunate to have had such a gifted and knowledgeable orator as our guide through our family's journey. 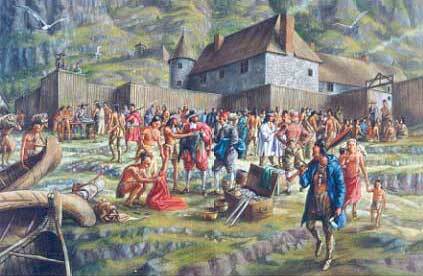 Starting from the recruitment by Samuel de Champlain's cousin of our ancestor Jean Gaudet, Roland took us through Jean's journey to some mysterious new found land in Nouvelle France in 1632. There he and his descendants, of which there are many, amassed what must have been considerable holdings, a good life, having found a place to prosper and to live. 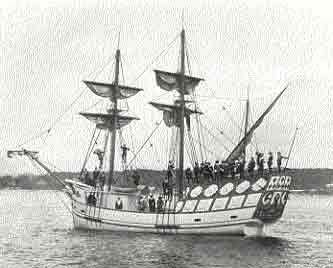 a small party of French explorers established Port Royal. Roland talked of the following years, how Port Royale changed hands 7 times between the French and the English as they vied for control of the continent. That is until in 1755 and, what is now recalled as, La Deportation. English soldiers gathered all the French colonists together, intentionally separating families, into different boats, destined for varied settlements. The people were scattered, a third of them decimated by abject misery. All this because they refused to give up their heritage by swearing allegiance to the English Crown and giving up Catholicism. This most horrible part of Canadian history is part of our family story. Our ancestors were scattered, some never to be seen or heard from again. Our direct ancestor was deported to Norwich, Connecticut, then somehow, 12 years later, he came back, this time landing in Montreal. He worked his way northwards to L'Assomption, spending the first winter at Ste-Marie Salome. The next spring in 1768 he went north east of St-Jacques where there were forests on the good land. It was hard to succeed there. Some short time later they went back to St- Jacques de l'Achigan where the land was easier to work. That area was also known as la Novelle Acadie due to all the Acadians living there. To have land for all the family due to the ever growing population squeeze, our ancestors was forced to move off again. This time Ernest, Pepere's father, brought us to St-Isidore de Bellevue, not far from where Louis Riel had had a small altercation with the federal government in Batoche. Zennon was already there, making it easier for Ernest, Cordelie and family to migrate west. They arrived with a fistful of dollars, a mighty $9 000 dollars in 1902, Ernest's proceeds from savings and the sale of his farm in Quebec. This sum in 1903 was enough to set up 4 different farms, for himself and his children. The settlement at Bellevue started to prosper. A few families multiplied to 8. Within a few decades Bellevue had 4 schools, one of them just for the Gaudets! Our family prospered and grew amazingly large out on the northern part of the plains. In 100 years we are over 300 descendants from Armand Gaudet. He was but one of the sons of the original prairie pioneers. We're the descendants of pioneers. 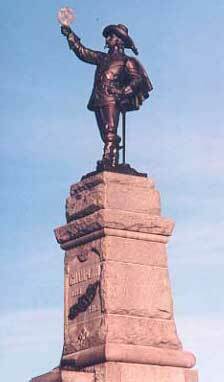 In the past 370 years we've gone from the heart of France to the heart of Canada. Our accomplishments as a clan have been great. We've been successful farmers, growing peas at opportune times, making money which allowed Pepere to travel to Quebec for a whole summer in 1946, seeing all the relatives, then giving away the car at the end of their holidays. Click on the pictures below to see their bigger versions! Click backspace to come back to this page!